Eat a relaxing dinner by avoiding foods that can trigger the release of stress hormones like coffee and those made from white flour. Up the ante by eating those which reduce stress hormone levels like dark chocolate and green tea. As you eat, focus your mind on the food rather than on your problems since this mindfulness is a very effective relaxation technique. Before going to bed, engage in activities with repetitive motions since they are known to help the body relax. For example, you can sew or knit after dinner to prepare your body for sleep. 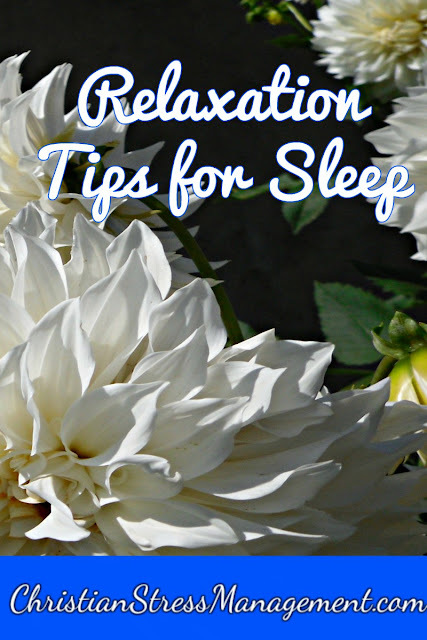 Engaging in a relaxation routine that includes the activities you have to do before sleep can also help you enter bed when you are fully relaxed. For optimum results, ensure that this routine also includes repetitive motion activities. For example, you can you can brush your hair 40 times, brush your teeth and read your Bible while listening to soothing Christian worship songs. After you enter bed, take several deep breaths to continue relaxing your body. As you breathe in, ensure that your belly rises so as to fill your lungs completely. When you exhale, make sure it falls so that you empty your lungs. Progressive muscle relaxation is another relaxation technique that you can do once you are in your bed. To do it, simply tighten the muscles of your right foot for a few seconds and notice how it feels before and after relaxing them. Follow this with tensing the muscles of the left foot, registering the sensation and relaxing them. Do this for all the muscle groups as you work your way up your body while ensuring that you become aware of the sensations of tension and relaxation. Meditating while in bed will help you relax even more.